Twenty thousand people clogged the streets of downtown Cincinnati. In the pre-dawn haze, chatter swarmed over a great many subjects, punctuated by the squeak of shoes against wet pavement and the spring-loaded slam of a hundred porta-potty doors. 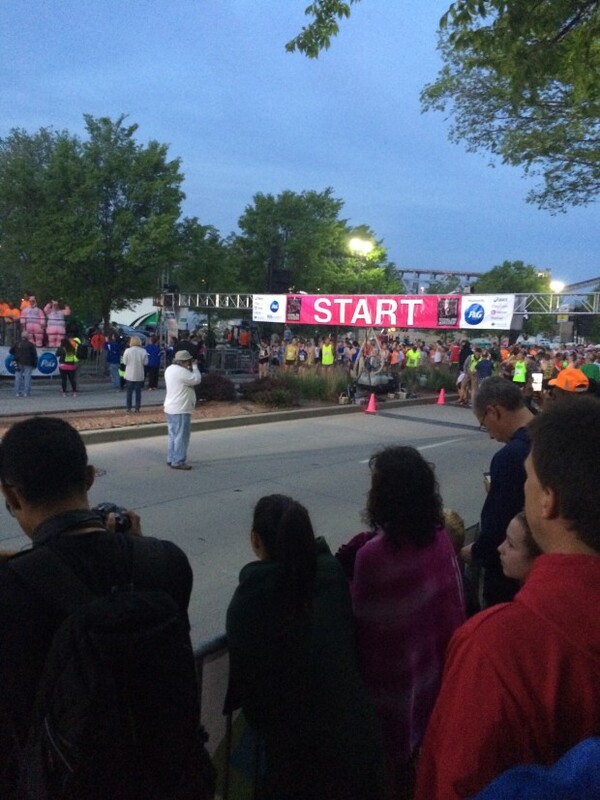 The stage was set for the 18th Annual Flying Pig Marathon. 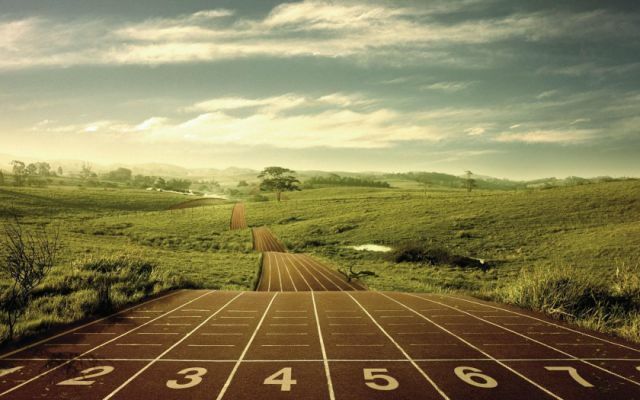 A thousand thoughts flood through your mind in those anxious moments before you cross the starting line. I hadn’t trained for this race. 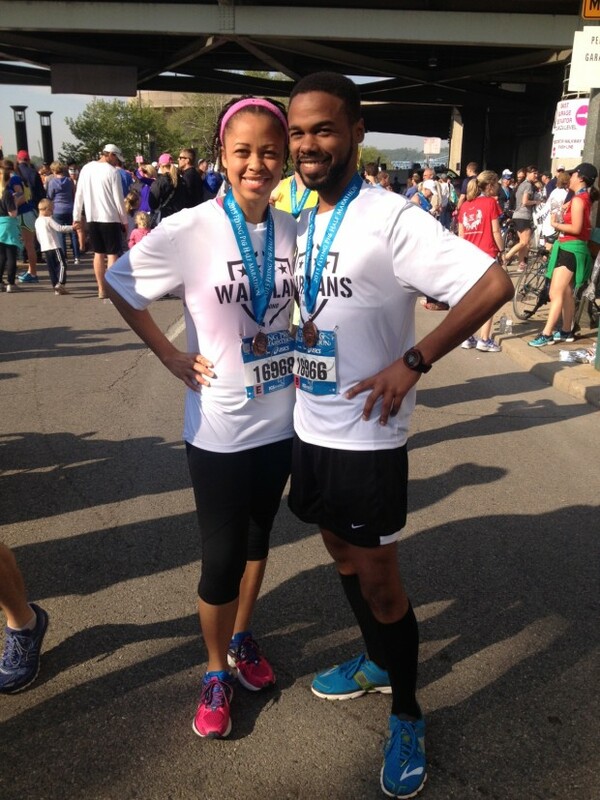 It was just another spur of the moment thing, just like the last marathon I ran. It wouldn’t be a record setter, I already knew that for sure, but I just wanted to get out there and run hard, make a new memory, and have a good time. I never could have imagined how it would end for me. I told myself it would be easy. 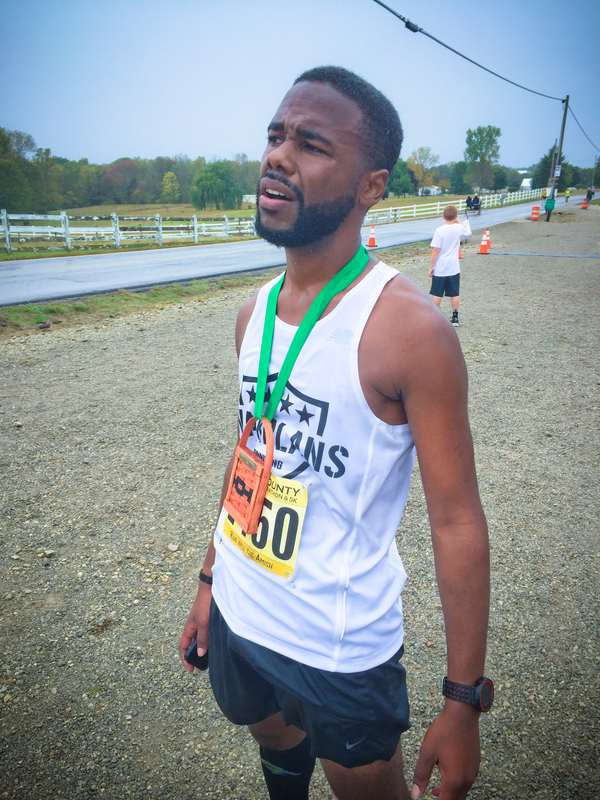 My last marathon, a month previous, was the most brutal I’ve ever run, and thanks to a mis-measured course, I was in nearly 28 miles of vicious hills–around 3,500 feet of elevation climbing and an equal amount of descent. Like a death-march, one by one, the trail claimed runners. As I started the second half, I debated whether or not I really should continue. Around 18 miles in, the trail took me down, and I struggled to carry on with bloody knees and bruised determination. When it was all said and done, it was my worst marathon finish time. Ever. This wouldn’t be like that. “These hills are nothing compared to that,” I kept telling myself. Others told me, it would be all downhill after mile 9. All I wanted this time was to keep under 5 hours. I figured it was a realistic expectation given my sporadic training schedule and my hectic lifestyle in the preceding months. The first miles of the race were as jovial as usual. I have this habit of randomly shouting out bits of goofy encouragement to my fellow runners along the way in a gravelly half-pirate voice. “Before us is the bridge to Ohio! Shall we turn back? Or shall we take the bridge? Take the bridge!” Half of the people laughed. The other half–well, the other half is irrelevant. I saw a woman look over her shoulder a couple of times and then heard her say to the man beside her, “I don’t see him.” I realized she was trying to see who was calling out. I ran alongside and said, “Be ye lookin’ fer a pirate?” We all burst out laughing. “Yaaar! A pirate in disguise!” The man said. “Aye, ye land lubber. Shall we take the bridge? The bridge is ours!” I shouted back. I kept seeing that same couple every few miles for the next few hours. It served to do much to ease the pain of the journey. Attrition is a terrible thing. In each of us, there is a measure of strength, of endurance. Any one of us could go one mile. Were someone to ask at the end of that mile if we were capable of going another mile, most would say yes. Repeat that sequence 6 times and there will certainly be a gradual taper of those willing to continue. The distance to be covered each time is the same, but the resources available are increasingly taxed and diminished. Anyone who has run beyond a half marathon can tell you that there is a real, physiological threshold the body crosses. After you’ve crossed it, everything your body stored up in preparation for the ordeal is gone. All you have left is your mind and whatever extra fuel you carry or is provided on the course. It takes a massive toll. Rocks become boulders. Hills become mountains. Hope becomes desperation. On the Flying Pig course, there was a massive hill that ended just before the course split for the half and full marathon, around mile 9-10. Like the nut I usually am, I shouted out random encouragement to my fellow runners, and slowly but surely, we crested the hill. I tried to recall the course map in my head. “I think it’s all downhill from here,” I said to myself. The previous year, when I’d done the half, it had been all downhill, so I was banking on the idea the full course was similar. I was sadly mistaken. There was a nice gradual downhill after the split, but from there, constant “rolling hills,” as they call them. It’s a net downhill. You go down more than you go up, but you go up a hell of a lot. 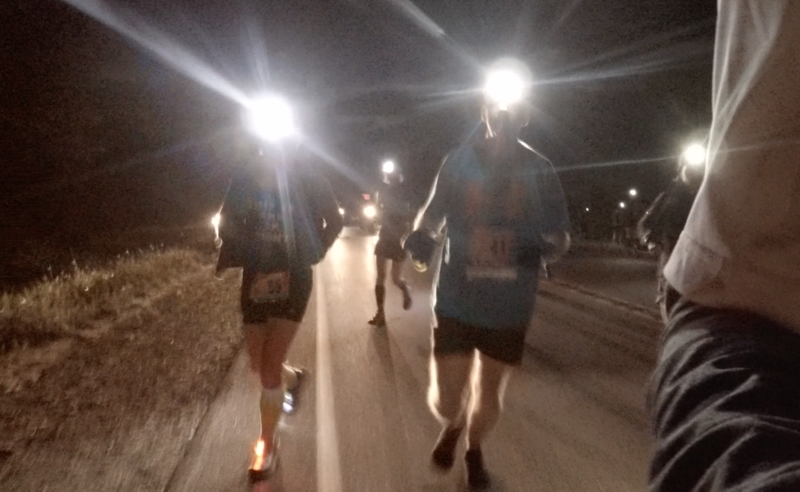 Sixteen miles or so into it, the 4:30 pace crew passed me. Part of me wanted to surge and keep up with them. 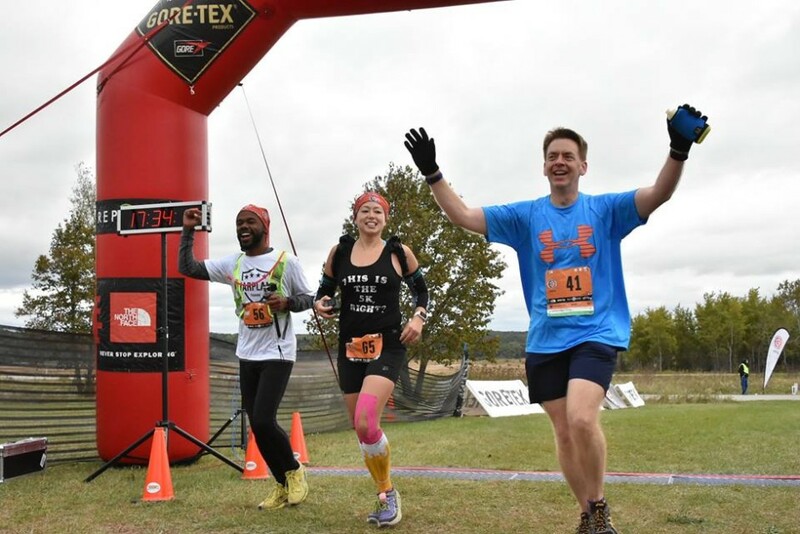 Another part of me knew there were still some hard miles left, and as my body sounded off a few warnings of the cramps that were soon coming, I realized I hadn’t brought the salt tablets I usually bring, which are my surefire cramp remedy. Better to hold back, pace myself, and see what’s left in the tank around mile 20. The humidity was totally awful. The sweat runs down your legs and into your shoes. If for no other reason, I’m in love with my inov-8 running shoes because, being so breathable, even when the sweat flow should be causing a puddle, my feet are still relatively dry. And no, I’m not paid to say that. They just work really really well for me. Anyway, I needed something…anything to get my mind off of the miles ahead. I looked for my pirate buddies. A “yaaar” would do me good, but they had vanished over the next hill. It was just me. Cramps hit hard. I had to stop and stretch. I hate stopping. Once the momentum is gone, it takes so much to get going again. I pushed a hard walking pace up the hill. There was another guy walking too. We struck up a conversation. It helped a lot. Within a few minutes, I’d been able to block out all of the pain of existence and movement, and I was ready to run again. The volunteers at the aid stations were so awesome. Their encouragements kept a smile on my face. “Young man, you’re doing great! You’re looking good,” one of them called out as I passed by. Just four miles to go. Soon I heard the theme from Chariots of Fire playing in the distance. A old fellow was sitting in his front yard with a speaker and a smile on his face. I couldn’t help but smile and wave. With just over a mile to go, I heard another sound. I couldn’t tell if it was crying or suffocating. I slowed my pace and came alongside a young woman who was fighting back tears, barely able to breathe. 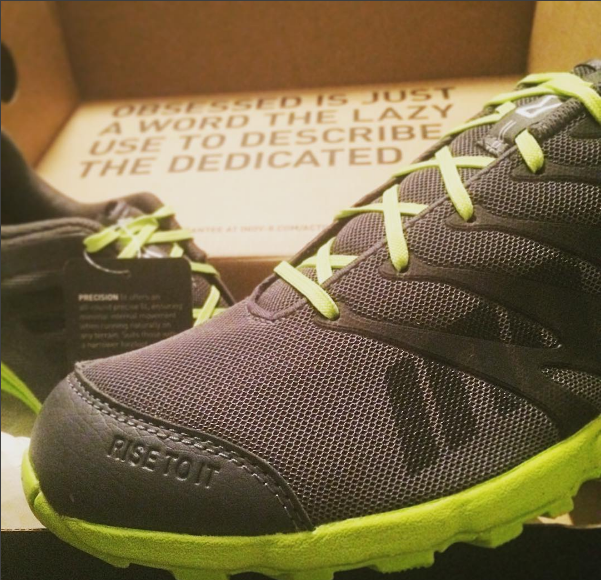 I could have kept running, but long ago, I learned that running isn’t just about me. It’s not about getting myself across the line. We’re all out there together. We are suffering together. And we can overcome together. I put my hand on her shoulder and asked if she was ok. She wasn’t doing great. She said she wanted to quit. She wanted to give up. I could tell she was in excruciating pain. I asked if I could stay with her. She said I didn’t have to. I stayed. There was a water station. We slowed to a walk. I knew how bad it hurt. I ran the same course. The hills were devastating. The humidity was stifling. The attrition. The attrition was deadly. In those last few miles, I’d been fighting back my own tears. And I never cry. I knew how bad it was out there. I was out there too. She was finally able to breathe. Within a few moments she said she thought she could run again, and so we ran. There was just one little hill left. And three quarters of a mile to go. The skyline that was once on the horizon was now spreading open for us. The cheers of the crowd grew just a little louder. I don’t know what I said to her. I just remember knowing, if I could keep her talking, it would keep our minds off of the brutal assaults of the pavement, and we would be one step closer to finished. Life is a marathon. A battle of attrition. Some people are able to rocket through all the way, but for most of us, the journey is slow and painful. Hills of despair break our will to move forward. The scorching of the sun sears what is left of our sanity. Resources are depleted. The resulting cramps threaten to immobilize us entirely. Left on our own, our defeat is all but assured. But we are not alone. Beside you is another, striving, struggling to survive. Alone we are weak, but together we are strong. 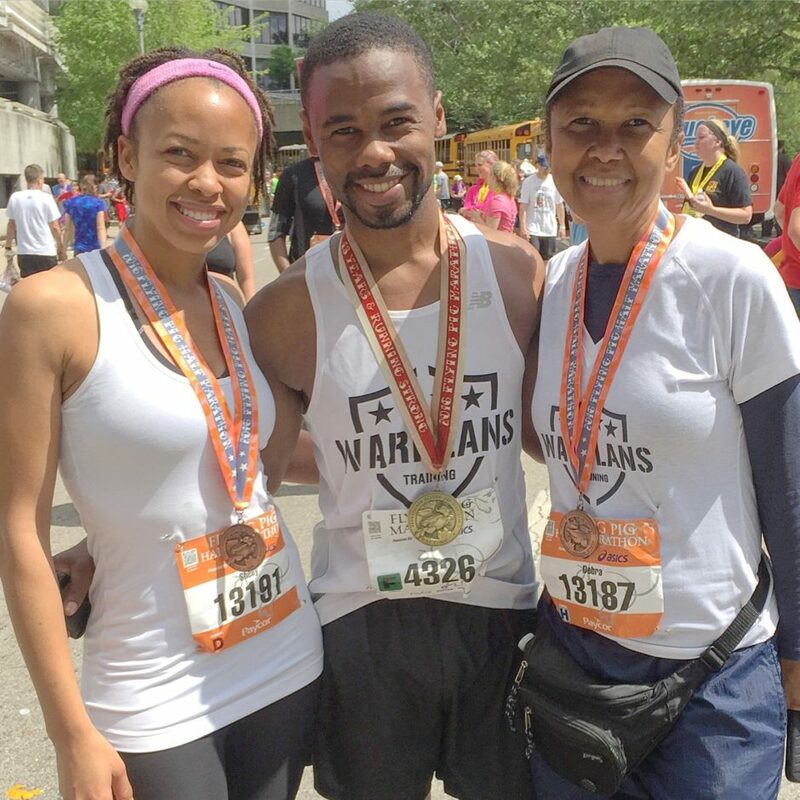 Before I started running those last miles with the young lady, all the thoughts that flooded my mind were how to keep from collapsing until after I crossed the finish line. I had accepted the certainty of collapse and was just bargaining with my body to hold our a little longer. I had to turn my focus from myself to the greater goal…for all of us to cross the finish line. And then our moment came. “Do you hear that?” I said, turning towards her. “They’re cheering. They’re cheering for you!” Across the finish line. The race was completed. They draped medals upon us. I turned to her and smiled. A sweaty hug between two strangers who didn’t even know each other’s names. It all impresses upon me a simple lesson in life. Alone, we may be weak, vulnerable, and unstable. Together, united, anything is possible. It takes a heart committed and a mind determined. No one gets left behind. 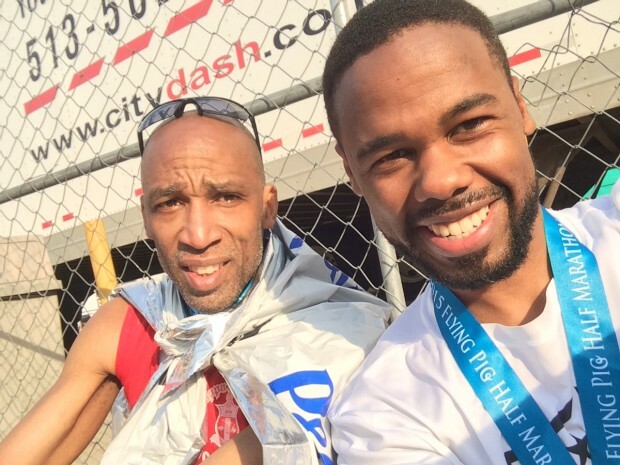 Not just in a marathon, but in daily life, if you could be that person, then be that person, and if you can’t be that person, find that person. Stick together. Fight together. Strive together. Suffer together. Overcome together. In this war of attrition we call life, there is only one way we all make it. It doesn’t happen all at once. It starts off slow, like the sun across the sky. In the moment, you wouldn’t know it has moved at all, but each second sends you hurtling through space and time. Eyes to the sky, and you won’t see it. The brilliance blinds your view. Turn your gaze to the shadows, the tide of darkness washing away all that you once knew. You’ll see the darkness gather and grow, mustering its forces in the quietude of dusk. That’s how it happens. One moment you’re living a life—living a dream. The next, you’re picking up the pieces, wishing you could awaken from the nightmare. How quickly what we once thought to be ours can slip away. Promises, vows—shifting sands. It’s not that we don’t mean what we say. Perhaps it’s that what we mean changes. Everything changes. Then, one day, the darkness reflected in the mirror bears no resemblance to the one you used to be. The strengthened fist turns to trembling fingers. Nothing certain remains. There is no faith. There is no love. There is no god. There is only time and chance. You turn to the broken altar where the supernatural once rested, and all is silent. The sun has set on your life, or what you once thought to be yours, and you understand for the first time that nothing is yours and you are nothing. Most turn from the darkness, fighting it, gripped by fear of the unknown, yet in it there is a warmth, a familiarity. The darkness within yourself can now be at peace. The base, the depraved creature within you is comforted and caressed by these blackened wings embracing you. Creature of darkness. Creature of the night. This pain you need. This music, haunting and serene. These chords, hallowed and chilling form the walls of your home. You are where you belong. You are what you were always meant to be. Like waking up from a surgery that you didn’t plan on having, I awaked Thanksgiving Day in a most confused state of agony. It was as if someone had surgically inserted a screwdriver under my left kneecap. Three weeks earlier, it had inexplicably begun. A stabbing pain in the knee. It’s made the monumental task of logging 40-50 miles of running each week all the more insurmountable. Every day was a new game of trial and error in the quest for mobility. 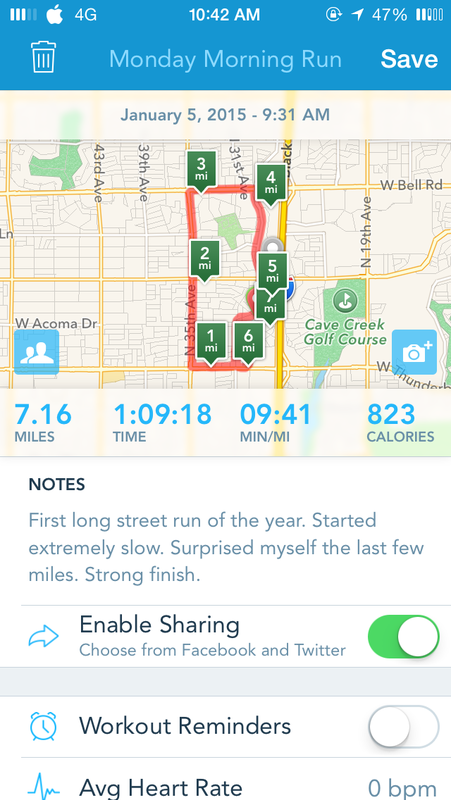 Some days the most I could muster was a pathetic limp, mile after mile. Now it was time for my final race of the year. I limped down the stairs at 7AM to see when my sister wanted to head to downtown Miamisburg for the start of the 37th Annual Turkey Trot. I didn’t expect much. I couldn’t expect much. 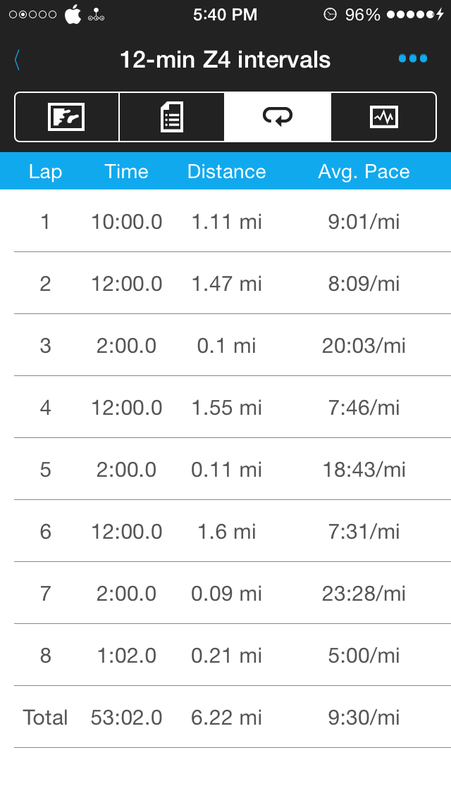 I was hoping at best to churn out a 9-minute-mile pace for the 5-miler. Clad in my WARPLANS training jersey, which I’ve worn in every race this year, but still with a notable limp, I made my way to the start line. A mile into the Turkey Trot, I felt something pop in my knee. It was an audible pop. It was weird. When it happened a couple more times, I started to be a little concerned about the integrity of the joint stability. Tentative and cautious with each stride, I suddenly realized my knee wasn’t causing any pain at all. It just might turn out to be a good run after all. Running without pain is a beautiful thing. I felt my stride lengthening and started passing my fellow runners. Cresting the hill, I could hear the burbling of the people I passed as they noticed my Run Against an Army shirt. “He must be Navy,” said one man, “Or Air Force,” a woman added. I chuckled to myself as the minutes and miles started to fly by. As the water station at the halfway mark came into view, I was just enjoying myself too much to care about time, and I didn’t even look at my race time on my watch for the rest of the race. I kept a few people in my sights, as usual, just to try to push a little harder. That’s half the fun of racing for me. Passing people. With a mile and a half to go, I noticed a guy pull up alongside me. Oddly enough, it seemed like he was looking me up and down. I paid him no heed. I was enjoying myself too much. I only had 3 more people to pass before the race ended. A younger boy, a teenage girl, and an older guy. I’d planned my pace and I was on target to overtake them all in smooth succession. Weaving back and forth over the next mile, I passed them all. A half mile to go, I saw the same guy who’d given me the sideways look pull up alongside me again. With a smirk on his face, he looked at me and said, “Try running against a Marine!” And he bolted off down the road. A half mile. Eight-hundred meters. Two-thousand, six-hundred and forty feet. In all of my runs, that last half mile is that moment when everything else becomes meaningless. All you’ve done up to this point is irrelevant. It all comes down to this sacred ground, from here to the finish line. No matter how tired, cramped, sore, and beleaguered the body may be, I’ve been programed through hours of sweat, days of toil, hundreds of miles of conditioning to push like my life depends on it. In all of my races though, it had only been a mental battle. I’d told myself I had to pass some specific person before crossing the finish line. But this time was different. The buildings of downtown Miamisburg blurred into a mirage. All I could see was the back of his shirt, just ahead of me. “You have to do this. You’re going to do this. Against an Army. Even against a Marine.” Three tenths of a mile. I made my move. I pulled alongside him as we made the final right hand turn to the finish line. I matched him, stride for stride. Quarter mile. It’s like something inside of me snapped. Sharp inhale. Surge. A finely tuned machine. No limits. No mercy. 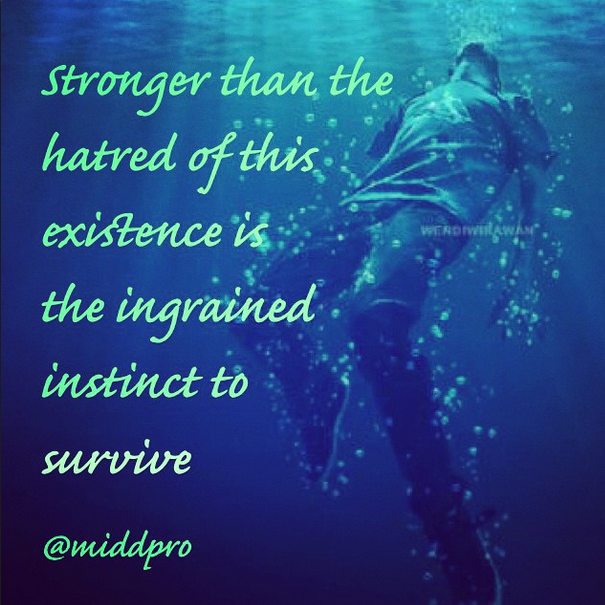 Something savage inside of me rose to the surface. With every stride, it was like fire through my veins. The race ceased to exist. The world ceased to exist. In that moment, it was as if space and time stood still. I was the master of my fate. No one could stop me. Nothing could slow me down. One hundred meters. I was running so hard, I felt the swelling urge to throw up. Fifty meters. Never looking back. Never knowing how much of a lead I had, if any. Nothing behind me was relevant. And there it was. The finish line. Sprint. Stagger. Stop. Breathe. I looked around. I didn’t see him. When I finally did check my race stats, I was shocked to see my Garmin clocked my final kick speed maxing out at just over 13 mph! It was otherworldly for a man who could barely even walk down a flight of stairs only an hour or two beforehand. These moments will remain etched in my mind. I could not imagine a better way to finish a year of epic races than this. The story was told over and over for the rest of the day. Thanksgiving. So much for which to be thankful. Family. Food. Fun. And the strength to run against an army and prevail. It starts in the pit of the stomach. Hours away from the start of the race, as I was staring at the ceiling, the seconds seemed to drag. I can never sleep before a race. I feel like I’m afraid of oversleeping and missing the race. 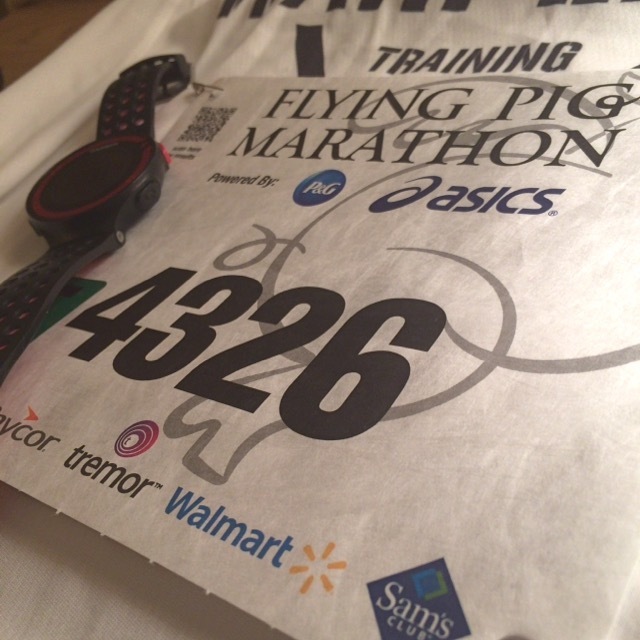 The Flying Pig was slated to be my biggest race ever. About 12,000 people registered for the half marathon alone, with a total of around 37,000 people registered for all the weekend races. All those people, and a massive crowd to boot. The stage was set, and my nerves just wouldn’t settle. Today was the day when piggy me would fly. Just short of the 2-mile marker, my bladder started singing a song to me about how smart I was to be fully hydrated. The ode was sensational, and not in a good way. The dilemma, to stop or not to stop. Porta-potties coming up on the left. Should I stop? Should I stop? I knew if I did, I’d jeopardize my shot a a PR. While struggling to make the decision, the opportunity passed. After a few miles, the internal serenade stopped, and I was able to enjoy some of the most breathtaking sights. Cincinnati is such a beautiful city at sunrise. The glimmers of day illuminated the shadows and highlighted a thousand silhouettes before me. We’re the warriors that built this town…From dust. On we charged, down the other side of the hills at a blistering pace. 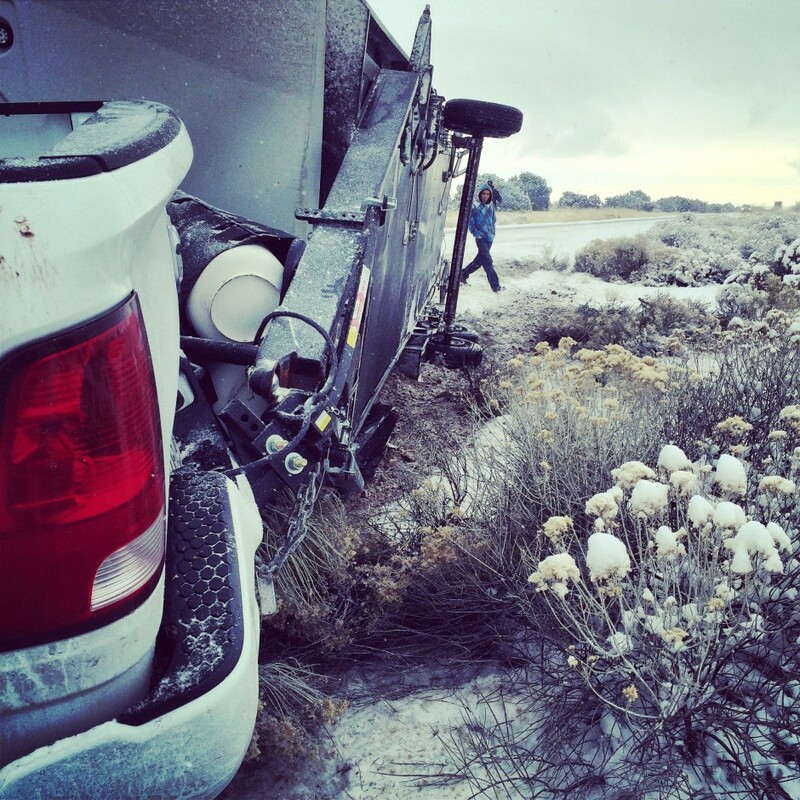 The pounding on the pavement was almost as bad as the muscular strain on the way up. Time for a little fishing. I spotted a runner a bit ahead of me. Subway shirt. “Pass the subway,” I said to myself. Within a half mile, I’d done it. Next? I saw another runner. She had a little water bottle attached to her waist. “Pass the bottle,” I told myself. For 2 miles I kept trying, but she wouldn’t let up. Not ever a little. “Come on. You’re faster than her!” Whether or not I actually was, I really needed to tell myself that, because I seriously couldn’t catch her. With just a mile left, I found one last gear and kicked into it. Ahead of me I saw a race clock coming up. When I got there, it was ticking past 1:43:00. I panicked. I wanted so badly to run a sub 1:45:00 half marathon, and with the finish line looming ahead, it looked like I wasn’t going to make it. “You didn’t come all this way to fail,” I said, starting a final push for the finish line. “It’s yours. Take it!” Ahead, I could hear the swelling chants of the crowd and the thuds of a hundred footfalls on the pavement. My legs said no, but my mind refused to yield, and I pushed into a sprint. 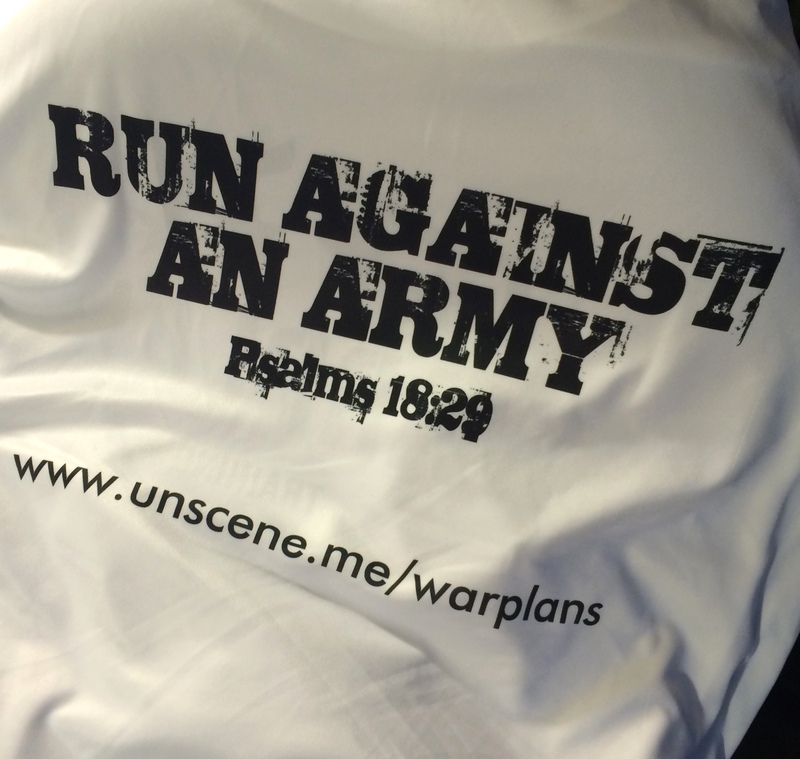 One after another, I passed runners, weaving back and forth as my WARPLANS Training shirt fluttered in my wake. The shirt had been a big part of my preparation. The message on the back simple, yet profound. Psalms 18:29. “With You, I can run against an army.” And here it was, the final moment. Two hundred meters. 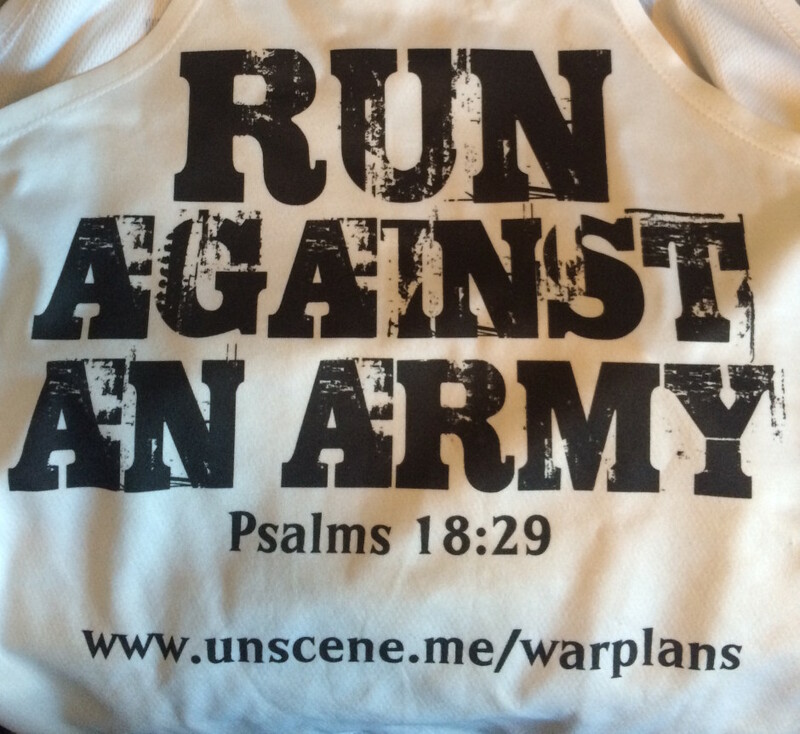 Overtaking runners by the dozen, I heard a stranger’s voice shout out from the crowd, “Go WARPLANS!” It was like I had wings. I soared across the finish line. I stopped to catch my breath. Did I make it? I checked my watch. Then I remembered, I’d started the race in the second wave of runners, and instead of being in danger of missing my coveted finish time, I’d beaten it. One hour, forty-three minutes. Exactly. The excitement was inexpressible. 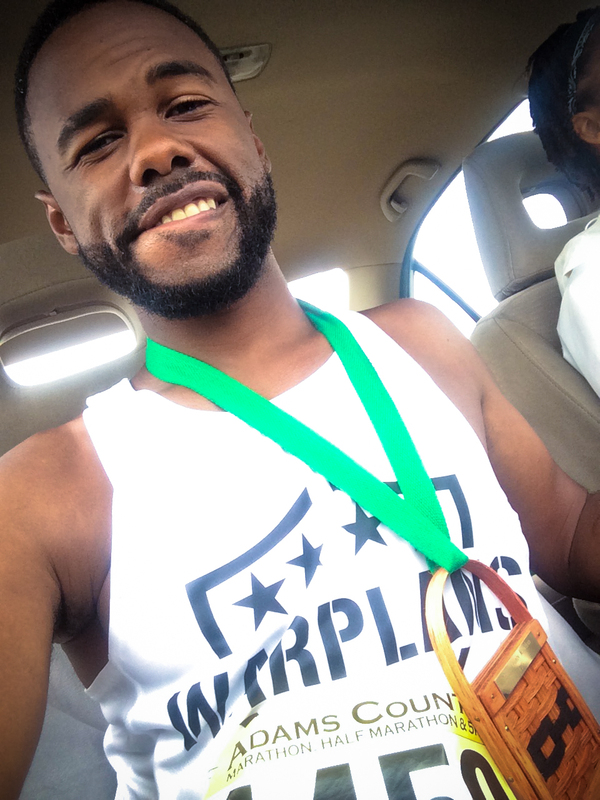 My legs felt like they were about to give way as I meandered through the crowd of finishers receiving their medals, mylar, and refreshments. Someone tapped me on the shoulder. “Man, you were so fast at the finish,” he said, congratulating me. I stopped to stretch and then took a seat on the ground, not feeling like moving at all. 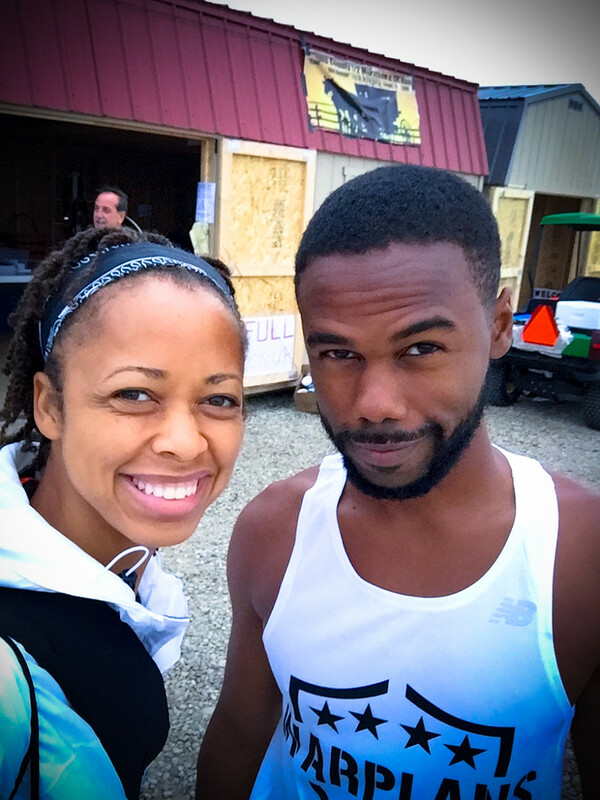 Another fellow runner, George, struck up a conversation with me, and we recounted the best and worst of our race. As we were sitting there against the fence talking, a random guy walked up to me and said, “Thank you. 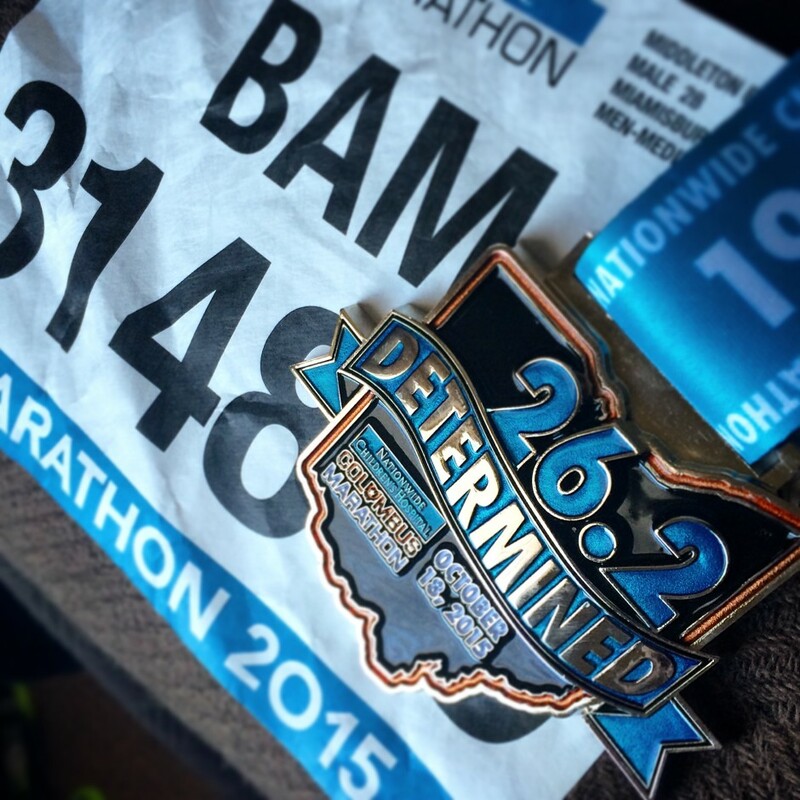 You really helped me make it up that hill.” Honestly, to me, that is what running is all about. Personal records are nice, finisher medals are cool, but the familial spirit that we share out there is what truly makes it a thing of beauty. It makes me realize that in those moments when I feel like giving up the most, maybe the best thing that I can do is try to encourage someone else. At the end of the day, maybe we’ll both make it. 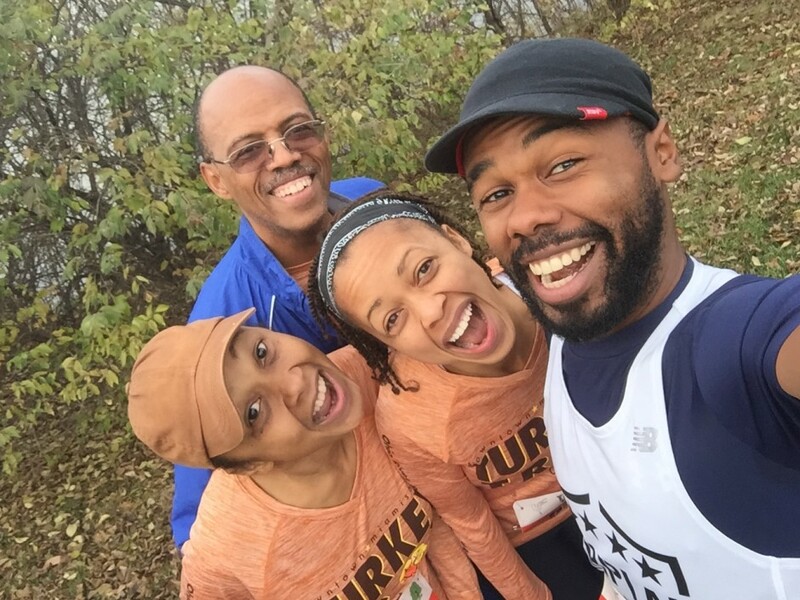 After a little more talking and resting, I found my parents and we then met up with my sister, who had just finished the race as well. She is truly an inspiration. She’s the one who first got me started running. I probably would have lost my mind otherwise, but thankfully I’m here. It was amazing to stand beside her and bask in the moment. Flying officially completed, it was then time for the pigging. We all went off to eat breakfast and relish the sights and sounds. There is so much to take in, and while it’s really a couple of hours, it feels like no time at all once it’s over. I still think the best sign I saw by the side of the road was: “Don’t be a Seahawk. RUN!” I got online and we checked the race results. I placed 565th out of 11,526. I could hardly believe that my finish time put me in the top 5% for the race. Unbelievable. We stayed at the restaurant, enjoying the delectable food until we were stuffed. It was such a great feeling inside. Feeling refreshed and invigorated, I made my way back downtown to catch the end of the marathon. I was so stiff and sore, but I am so glad I did. When I arrived, the race clock was ticking close to 7 hours. At the finish line, only a few dozen people lingered to cheer on the stragglers. What I saw, I will never forget as long as I live. 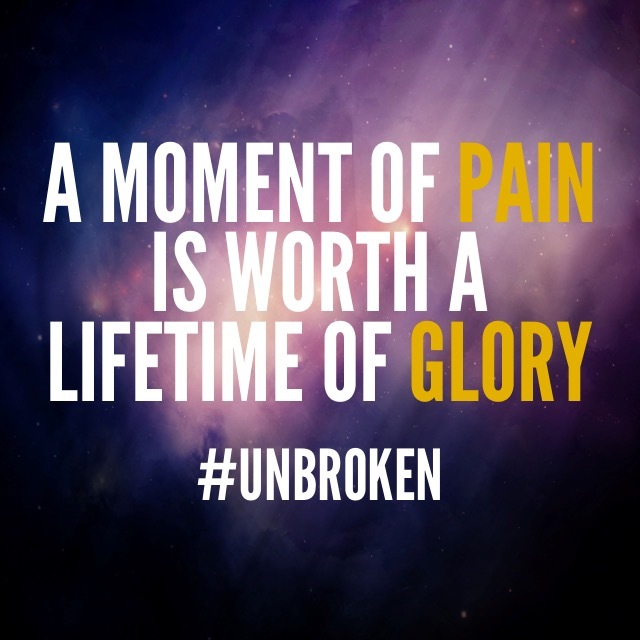 There is no glory. No one knows your name. Scarcely a soul is even there to see it. But these people give their everything to cross that line. Seven hours in the sun. Seven hours! Some had the energy to run across the finish line. Some walk. Some look like they might have to crawl. I watched as an older man staggered to the finish line. Twenty-six miles he’d come, and I wasn’t sure he would make it. His legs faltered beneath him. His body keeled over to the left side just to keep balance. His entire figure was askew. His gait, if you could call it that, was a feeble limp. He might not make it. Something inside of me welled up, and I started screaming cheers for him. The few people near the finish line joined in. His head never raised up. His eyes never left their steadfast gaze upon the pavement just in front of him. I’m not even sure he could hear us shout, but we could all feel his determination, and we cheered all the more. In my head I can hear the rhythm pick up as my imagination queued the opening lines from “Till I Collapse” by Eminem. Sometimes you just feel tired, you feel weak, and when you feel weak, you feel like you want to just give up. But you gotta search within you, you gotta find that inner strength and just pull that out of you and get that motivation to not give up, and not be a quitter, no matter how bad you want to just fall flat on your face and collapse. One step at a time, he drew ever nearer to the finish line, until he had finally made it. 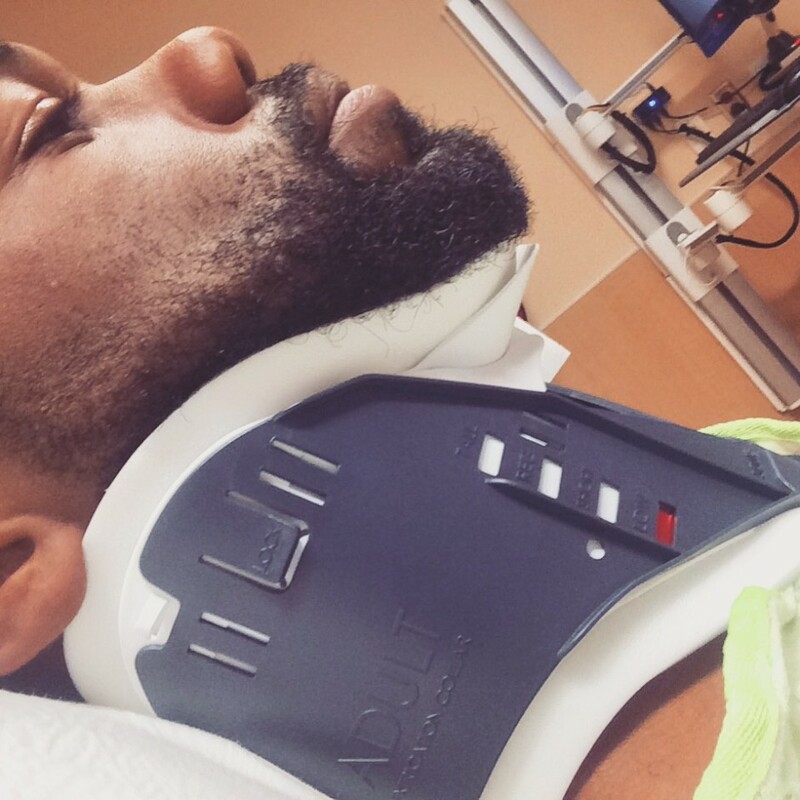 Medical staff wheeled him away in a wheelchair as we all breathed a sigh of relief. It got me thinking about just how invested he was in finishing. 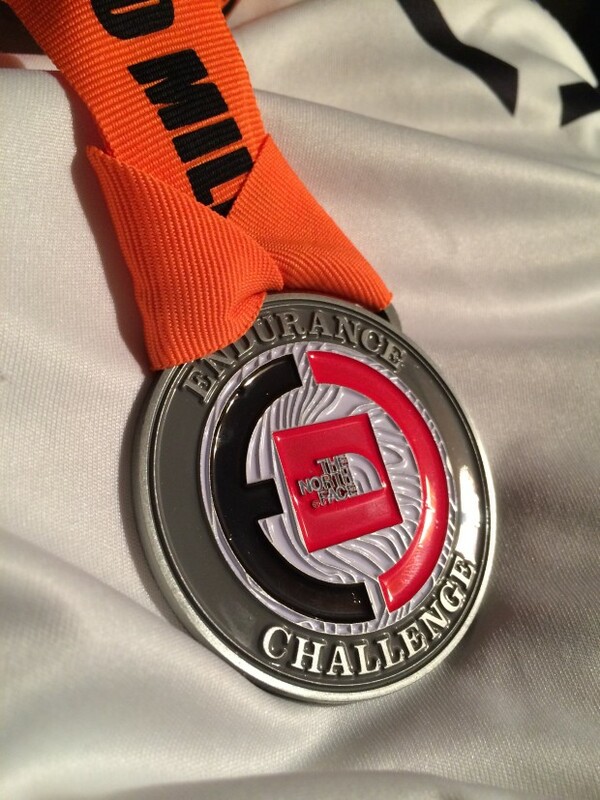 For me, finishing the half marathon wasn’t a huge challenge. I knew I could finish it before it started, and when I did, I could have easily continued on for miles more. I was sore and tired, but I was nowhere near a breaking point. But this man…this man showed the true heart of a champion. 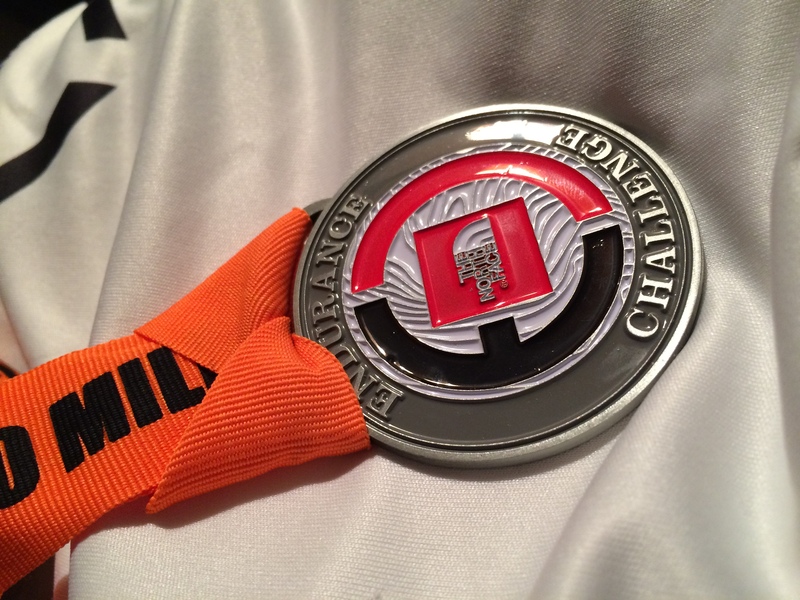 He left it all on the road, and when there was nothing left in the tank, no strength left in his legs, he willed himself across the finish line. It was an extremely emotional sight to watch, even for me. Close to a half hour later one other person caught my eye. She was a middle aged woman, and she looked so tired. No bounce was left in her step, no strength in the stride. Just that same will power I’d seen in so many of these last few finishers. As she came within the last 100 meters, just as she was alongside me, I saw her take a deep breath, and as a single tear slowly rolled down her cheek, she raised her face to the sky a silently mouthed the words, “Thank you.” It was a moment I’ll never forget. For most of my life, I’ve been most inspired by the winners of the race, setting records, finishing in fabulous form. But now? Now it’s different. Right now the ones who inspire me most are not the first to cross the finish line, but the last. A mountain of time has passed since I wrote thoughts of mine with any intent for them to be shared. My monologues and my life have been decidedly closed for a long time now. At this point, almost no one knows where I am and what I’m doing; for all intents and purposes, it would seem I’ve fallen off the face of the earth. In many ways I have, but if there is one of which anyone can be assured. Wherever I am, I am running. Within the next week, I will have logged over 700 miles of running this year. Perhaps with the only exceptions being a 10k and a half marathon, those miles were logged in solitude. It’s not easy running alone. Over 100 hours of one foot in front of the other, the glare of headlights at night, greeted by sun, rain, wind, hail, snow, and ice, listening to the serenade of rubber shoes greeting the pavement and leaving fragments of themselves behind. Maybe sometimes I’m running to reach a goal. Other times, it would seem like I’m running away from something. It could be both. I’m running from reality, finding comfort in my worst fears because their terrors are far more compassionate than the truth; the nightmares are my solace. It’s the waking up that I’ve dreaded. Yet, as surely as I run to escape my reality, I am running towards hope…hope that there is something better ahead, somewhere. Anywhere. For a time, I had stopped believing, not just losing sight of hope, but losing the ability to imagine what hope could ever look like or where it could ever be found. But now I run. It’s not easy running alone, mile after mile. In those wide open spaces, you face a lot of demons. It could be said, every day out there is a war. Most days, victory is just as simple as committing to run. Daily determination to go and run, no matter what, gives me the upper hand in the battle of mind and body. I can honestly say, I would not have survived this far into the year were it not for the strength I’ve found in running. Every day is a challenge, but the lines of conflict are clearly defined. 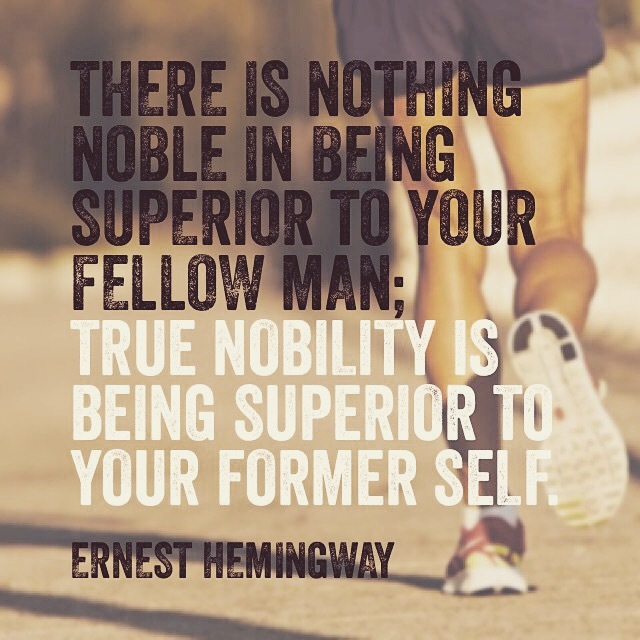 My goal is to be superior to my former self, and the goal is obtainable. 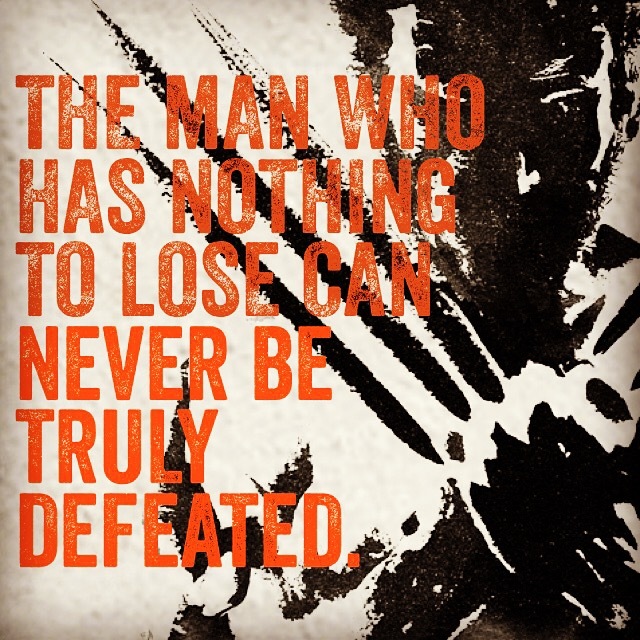 Every day has that battle, and every day, it is a battle I can win. I gave up on the future, and I’m finally ok with that. The future is so vague and uncertain, and a person like me can get so wrapped up in the possibilities that the present is lost. For me, for now, there is only the present. There is today. And today is mine. Now, just days away from the biggest race of my life, I see the strangest parallel between training and living. My heart is filled with appreciation and resentment. As my feet repetitively greet the pavement, I’ll be surrounded by something foreign to me. There will be faces, hundreds and thousands of faces lining the way, cheering, chanting, encouraging us along. I run alone. My joys and sorrows, my euphoria and pain are mine. I’ve come to know them all so intimately, and yet suddenly a mob is rejoicing over every step I take, telling me I can make it. I will appreciate it greatly. For a moment the world recognizes, appreciates, and celebrates what has led me to this moment. I’ll definitely appreciate it. All the while, a part of me wonders if I will resent it as well. There’s that voice deep inside asking, “Where were you when I faced sub-zero wind-chills and froze the capillaries in my hand? Where were you when I limped from the car to the gym because I had to get that workout in? Where were you when the sweat-diluted tears ran down my face as a struggled to find the will to put in one more mile? Where were you I was ready to give up? You weren’t there. I was running alone!” The intellectual resentment grows as I ponder over how many people cheering by the wayside have even the slightest clue what it takes to make it this far. But then I ask myself, does it matter? I’ve made it this far. I made it without the crowd. I don’t need them. I can finish this without a soul watching or cheering me on. So what? They ARE there. They ARE cheering. They won’t always be there. Their voices won’t always be shouting. So appreciate it. And finish the race. For you. For them. And most of all, for those who can’t. And so it translates into the rest of my life. From the moment my world fell apart until now, I have been alone. In the past nine months, the worst stretch of it all, I can count on ONE HAND the number of people who know me who have actually checked on me more than once every couple of months. A face recognized and a name known across the country, and yet the number of people who have consistently checked on me more than once every few months is less than five. I’ve been living alone, trying to believe I’m bigger than everything that’s happened, but knowing deep down inside that I’m not, all the while attempting to convince myself it’s better to live half alive than not to live at all, though it may not seem to be so in the midst of such grave darkness. For all intents and purposes, just as in my training, I’m alone. I’m coming to a place where I’m ok with that. I’m coming to a place where I don’t hold it against anyone for not standing by my side through it. If the truth be told, scarcely a soul yet even knows of the darkness of which I speak, so how could someone rally or stand by my side through it all? Everyone has always looked up to me. I was the hero. I was the giant. No one expects such a one to have needs or suspects the demons they must be fighting alone. I just ask myself, will that moment come when I’m running along and hear the shouts of a crowd ahead? Will there come a moment when people can see how far I’ve been running alone and recognize, appreciate, and celebrate every step I take? I don’t know if it will. I tell myself it doesn’t matter. I’ve learned through the pain, sweat, and tears, the victories and defeats, the angels and demons, the mountain tops and the valleys that I can do this. I can keep running…alone. I don’t need the crowd to cheer me on. I’d finish the race even if they weren’t there because life has forced me to be this strong just to survive. But if there ever is that moment, if there ever is a crowd, if anyone can ever imagine or conceive of where I’ve come from and what I’ve been through, if they do shout my name and tell me I can make it, I will appreciate it. And I’ll keep running. I will finish the race. For me. For them. And most of all, for those who can’t.